From a long time ago, the straw hat is one of the most popular types of hat for the summer. It is well loved for several reasons. The straw material is often lightweight and breathable. Also, it is capable of blocking the harsh sun rays pretty effectively. And who doesn’t love an elegant and beautiful hat that can enhance your style a great deal? Choosing a suitable straw hat for women to wear in 2018 is not an easy task given the fact that there are many features to consider. 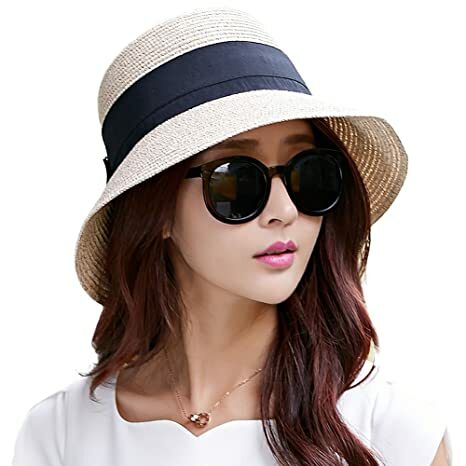 You can read here https://thebesthat.com/look-pick-right-sun-hats/ for more information on choosing the right straw hat in the summer. 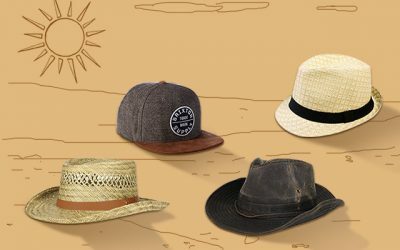 To make it easier for you, we sum up some of the best straw hats on the market- which are made of excellent craftsmanship and high quality materials to ensure your best experience. Check them out to see which one is the best for you. If you are looking for a beach straw hat featuring the Panama style, take a look at this beach sun hat from Lanzome. This hat is made of 100 % of high quality natural paper straw in the woven style. The brim of the hat is 2.9 inches which is enough to cover part of your face. However, if you want a wide brim hat that can effectively cover your neck and your ears, this hat might not be enough. Still, the good point of this medium wide brim is that it will not cover your face as well as your vision in case of a high wind. It is worth mentioning that the brim can be folded up or down. 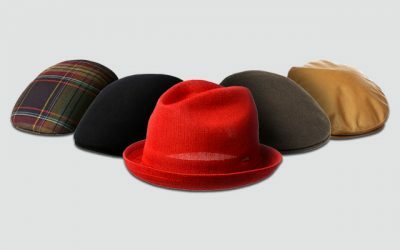 You can also reshape the brim in various styles as well. While this hat is available in 1 size, it also features an inner head band that you can adjust to make sure you have the best fit with the hat. In addition, the material of this hat is made of the premium natural straw which is tightly woven for the best quality and durability. In addition, it is breathable and cool enough in the hot summer days. It is rated UPF 30 + for the ability to block the harmful UVAs and UVBs. And last but not least, you can easily crush and fold this hat to make it super convenient for you to bring this hat with you when you go travelling. 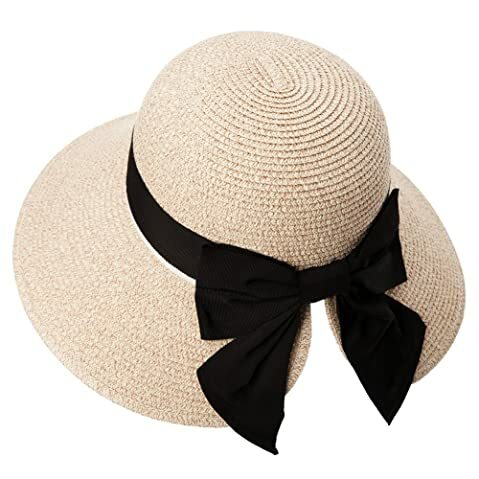 With a simple yet elegant style, you can wear this straw fedora hat when you go out at the beach, camping, hiking, or when you take part in any outdoor activities, including gardening. With the natural material, this straw hat needs extra care. 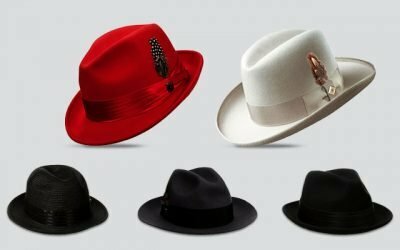 Hence, you should check this guide https://thebesthat.com/clean-straw-hat-easy-methods-follow/ for more information on how to clean a straw hat like this one to ensure the hat can look nicely and maintain its shape well. 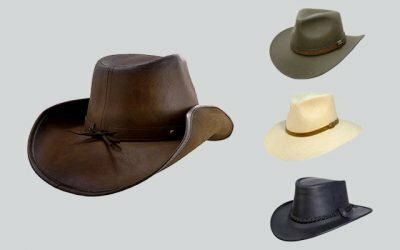 Stetson is undoubtedly one of the most reputational brands of hats on the market, especially in the States. 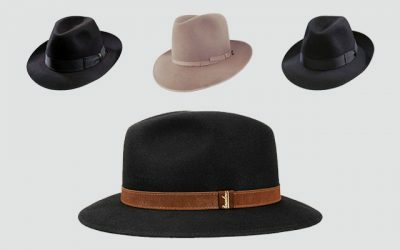 The company is well known for producing high-quality fedora hats and cowboy hats from the most premium material. You can also find several options of stetson straw hats on the market such as the Moterrey Bay. This straw hat features the classic and original Western cowboy style with a distressed and stained look. Besides the straw material for the body of the hat, this hat features a hatband which is made from real leather. The iconic Stetson medallion is also attached to the band of the hat. 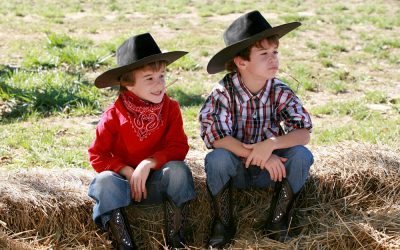 As I mentioned above, you can rest assured with the high quality of the Stetson straw hat. First of all, the material of this hat is of premium quality which not only breathable and lightweight but also water resistant and durable. Second of all, it is well made with an excellent craftsmanship for the sturdy construction. The brim of this hat is firm and will not become floppy regardless of how windy it is outside. Unlike other straw hats on the market, this hat is available in 4 options of size- ranging from Small to Extra large for you to find the best fit. The green stain color is pretty unique and you will not be able to find such color anywhere else. 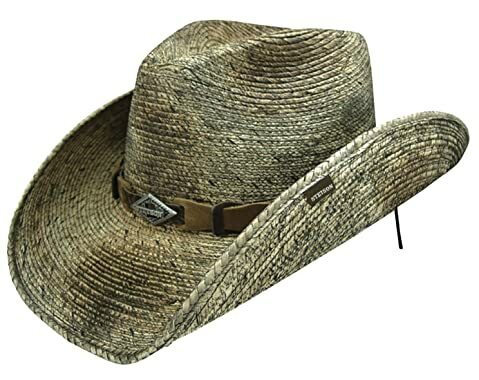 With the distressed cowboy look, you can pair this hat with your Cowboy-inspired outlook or a Western classic outlook. One of the most naturally looking straw hats that I have ever seen, this beach sun straw hat is made of 100 % of natural straw as well. The brim is 3 inches in width and the crown is 4 inches in height. With this straw hat, you can choose among several bright colors such as pink, orange, or yellow. There is a ribbon in the contrasted color attached to the hat. With the elegant and still somewhat simple design, this sun hat is so versatile that you can wear both when you go to the beach and when you go out for your daily activities. 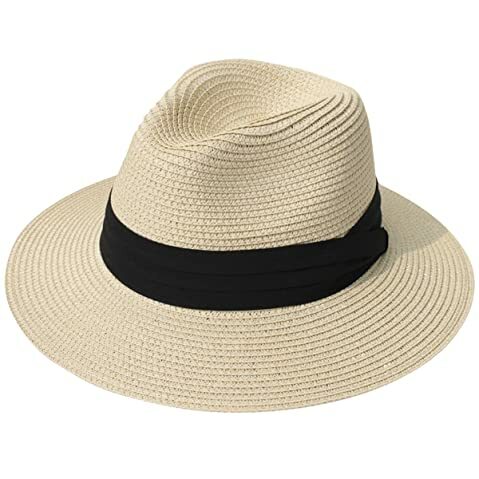 Like other high quality straw hats on the market, this beach straw hat is made of straw of the highest quality which is cool, breathable, and also very lightweight, making it comfortable for you to wear all of the time. In addition, the straw is woven tightly so that the fabric is rated + for the ultraviolet protection. 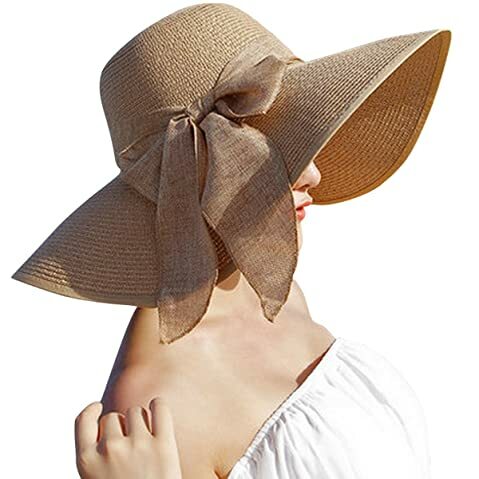 As a result, this straw sun hat will block the harmful elements from the sun rays to effectively prevent sun burn and other skin damages for you. Last but not least, this straw sun hat is made carefully for a firm and solid construction. While you can easily fold or bend the hat to pack it for travelling, it will remain the same original form after you take the hat out. However, there is no chin cord to make the hat stay secured on your head in case of a big wind. Here comes a unique straw hat for women who often wear a pony tail. This straw hat is made of 100 % of paper straw braided. It is available in 1 size with an adjustable tape built inside the sweatband to ensure you have the best fit with this hat. And there is a bowknot attached on the back of the straw hat with the design for the ponytail. 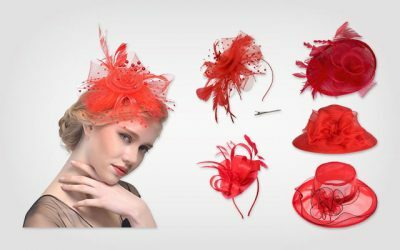 The design does not only make the hat functional and convenient, it also makes the hat have a charming and beautiful look. The straw is braided tightly to effectively prevent the harmful elements from the harsh sun rays. In addition, the fabric is tested to pass the UPF 50 + test, showing that the hat can effectively protect your sensitive skin. The brim of this straw hat is 3.7 inches, which is wide enough to cover your face as well as your ears. In addition, thanks to the chin strap which is adjustable, the hat can stay secured on your head in case of a big wind. It is foldable and packable without deforming the hat, making it a great choice to bring along with you when you go on a beach holiday. There are 8 options of colors for you to choose from including beige, blue, and grey. 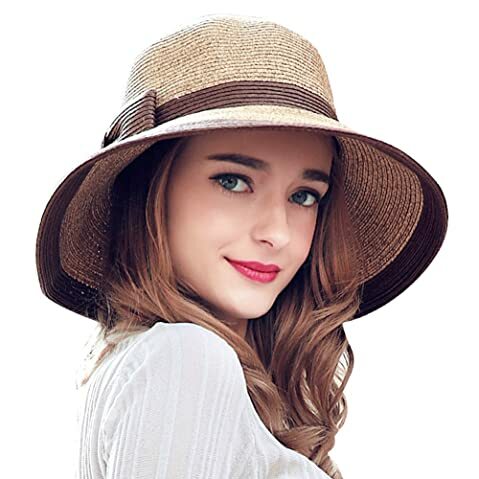 This straw hat also has the black version so provided that you are looking for Black Straw Hats For Women, you have come to the right place. If you are looking for a beach straw hat with a natural look, check out this straw hat from UPhitnis. There 6 options of colors for you to choose from such as beige, coffee, and chocolate. This hat is available in 1 size with a tie for size adjustment. It features the weave texture and a ribbon attached to the hat. There are many reasons why you would love the hat. First of all, it is very convenient to bring the hat along with you. You can fold it flat and pack it in your suitcases, bags or backpacks. Second of all, this straw hat can fully protect you from the harsh sun rays. Not to mention that the material like this one is cool and well-ventilated. Third of all, the wide brim of this hat can provide protection for your face as well as your ears and your neck. In addition, the construction of this hat is very firm and solid. While you can easily bend the hat or change the shape of the brim, the body of this hat would remain the same quality. 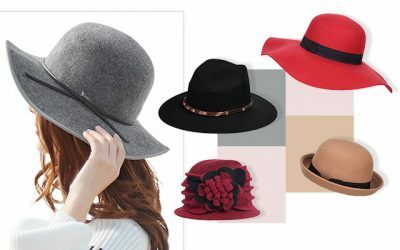 Last but not least, with the simple yet elegant design, you can easily match many kinds of clothes with this hat- from dresses, to Jeans and t-shirt. Among the White Straw Hats For Women, this white straw hat is the one with the widest brim and the most elegant look. Other options of colors for you to choose from are khaki, beige, royal blue, and yellow. This straw hat can make you look charming and adorable thanks to the wide brim and the big bowknot on this cap. Besides the look, this straw hat is made of the premium quality which is soft on the skin, breathable and comfortable to wear. Furthermore, this hat has a strong sun UV protection with the UPF of 50 +. 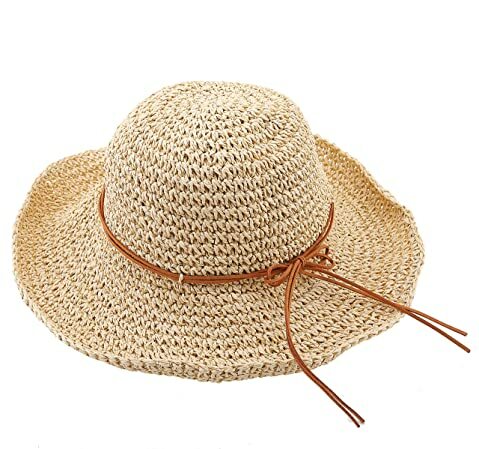 Also, the wide brim of this hat not only brings the elegant look but it also provides a great shade for your face, protecting your sensitive skin from the harmful sun rays. You can also pack the hat inside a small bag and bring along with you when you go travelling. The material of this hat is breathable and durable. And not to mention that this hat is made with an exquisite workmanship and neat stitching to ensure it has a firm, sturdy and durable construction. The problem with this hat is that the brim is quite big with no inner wire. Therefore, it can become flimsy in case of a big wind and block your eyes. This straw beach hat is made of 100 % of paper straw which are braided to form the fabric of the hat. It features a large pony style brim and an oversized ribbon to add more elegancy and accent to the look of the hat. And most significantly, if you often wear pony hair, this hat is the best option for you. The width of the brim is 3.7 inches, which is pretty enough to cover a wide area of your face, your neck, as well as your ears. The brim can become quite flimsy though, in case of a high wind. 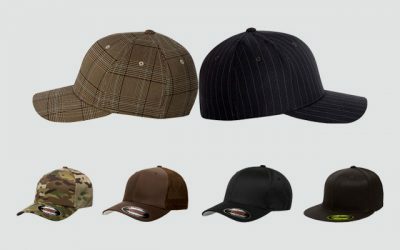 The material makes the hat foldable and also packable without any crease appearing on the hat afterwards. Not to mention that it is also rated 50 + for the ultraviolet protection factors. Along with the wide brim, the hat can protectively and effectively block most of the sun rays. There are 11 options of colors for you to choose from- from the dark colors such as navy to the brighter options like beige and royal blue. While this hat is available in 1 size, there is an internal sweatband built inside the hat. The sweatband is adjustable for you to have a good and secured fit with the hat. It also prevents the straw material from rubbing on your forehead, causing irritation. And since it is well ventilated, it can keep your head cool all of the time. And if you want to have a straw hat to wear when it is windy outside, this one is ideal for you. A chin strap is attached to the hat to make sure it can keep this straw hat stay secured on your head. It is also adjustable for you to have the best comfort with it. 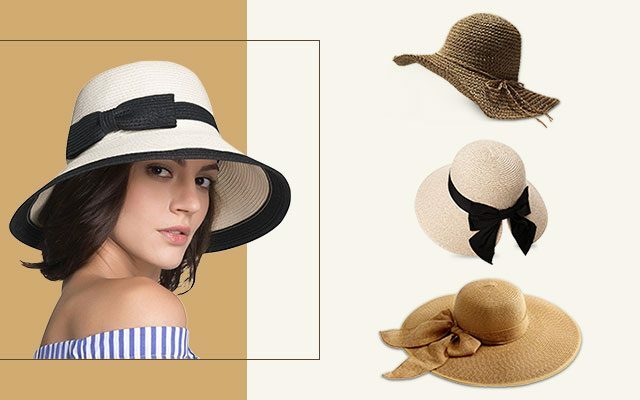 If you want to buy an elegant and adorable straw hat, one of the brands that you should have the first look is Simplicity, the brand of fashionable and high quality headwear. And you will get these features with this hat. 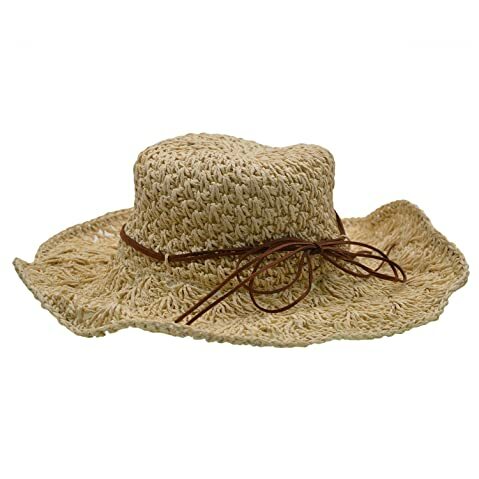 This straw hat is made of 100 % of braided straw featuring the wide brimmed sun hat style. The material is undoubtedly very lightweight and breathable. The straw is braided tightly enough to prevent the harsh sun rays from entering and damaging your sensitive skin. The brim of this straw sun hat is 5 inches, which is wider than most of the straw hats on the market. With such a wide brim, your face, your neck, as well as your ears and your shoulders would be protected. Also, the wind lanyard helps to keep the hat on your head throughout your activities. However, keep in mind that the brim is quite floppy which might block your view in case of a big wind. You can choose among 6 different choices of colors- from brown, white, and black. You can wear this hat when you go out with your friends or when you take a beach holiday. 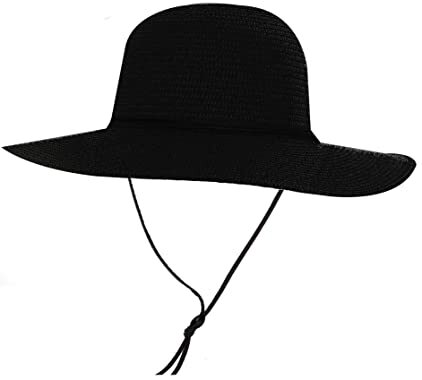 With a wide brim and a great protection, this hat is also a great choice for you with the gardening tasks. In case you are looking for girly and elegant Floppy Straw Hats For Women, you can check out this straw hat. It has a lovely bow and folding floppy design to make sure you can look as charming as possible on the beach. You can pair it with a wide range of clothes, from dresses, to beachwear clothes. You can also wear this hat when you wear casual clothes. This floppy straw hat is available in 2 options of colors which are light coffee and beige. The brim of this straw hat is 4 inches, which is wide enough to cover your face effectively. The material of this straw sun hat is undoubtedly of the premium quality. First of all, it is lightweight and breathable to keep your head cool all of the time. In addition, it can be folded and packed for easy storage or carrying around when you go travelling. The construction of this hat is quite sturdy and durable thanks to the excellent craftsmanship which is used to make this hat. Still, it would need extra care to ensure that quality of the straw would remain the same after a certain amount of time. 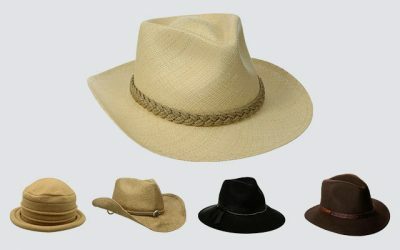 For more information on cleaning straw hats, you can check out this article https://thebesthat.com/clean-straw-hat-easy-methods-follow/. 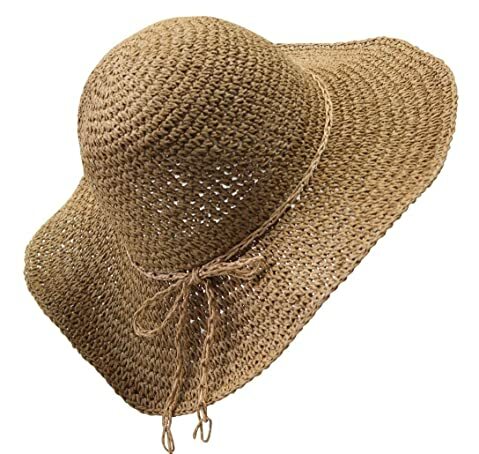 The next straw beach hat for women comes from Home Prefer. This hat is made of man-made straw featuring the wide brimmed design of a bucket hat. This straw hat is available in 3 choices of colors including brown, camel, and white. Each hat comes with a head band and a ribbon of contrast colors. The brim can be bent upwards or downwards whichever way you feel more comfortable. Overall, it has a classy and elegant look that you can pair it nicely with a summer dress. The brim of this hat is around 5 inches, which is wide enough to cover your face and your neck away from the harsh sun ray. The hat is super thick so that no harmful elements from the direct sunlight can penetrate. 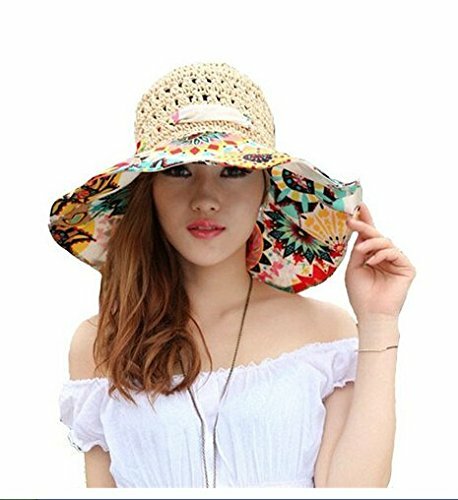 However, it makes this straw sun hat a little bit thicker than other types of straw hats that you can find on the market. It can be stiffer but luckily, the inner sweatband is super soft and comfortable. It can also absorb sweat well to keep your head cool and prevent irritation effectively. This hat is available in 1 size with an adjustable cord for you to have the best fit. However, for a free size that, this straw hat runs a little bit small. It can fit head with the circumference from 21.65 inches to 22.8 inches. 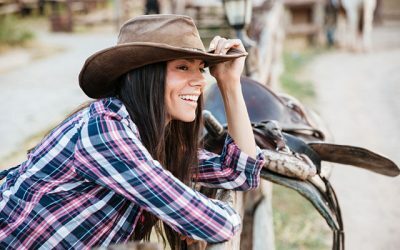 If your head’s size is about 23 inches or more, you should check out other straw hats for women on this list. This straw hat is made of man-made straw for the crown and cotton for the brim. You can choose among 3 options of colors including beige, pink, and rose red. The brim of the hat features the flowery patterns. The width of the brim is 5.9 inches and the height of the crown is 4.3 inches. The brim, as you can see, is wide enough to cover your face, your neck as well as your ears and your shoulder. Unlike some of the floppy straw hats, this straw hat will not become flimsy as there is an inner wire in the edge of the brim. With such a wide, not only can the brim stay secured, but you can also shape it to the shape that you like. The material is quite thick and in my opinion, this straw hat seems a bit stiffer than other straw hats. With the unique flowery design, you will instantly look trendy and fashionable. It is also very unique and will surely make you stand out from the crow. Straw Hats For Women with saying might make you look elegant while a straw hat with unique pattern like this one will you look more chic and stylish. That is all about the best straw hats for women that you can find on the market in 2018. Straw hats can be made from natural straw or man-made straw, braided or woven. No matter what style, design, and colors of the straw hat that you would like to buy, make sure that it is breathable, lightweight, and at the same time protective and durable. The brim of this straw hat is another factor that you should consider. 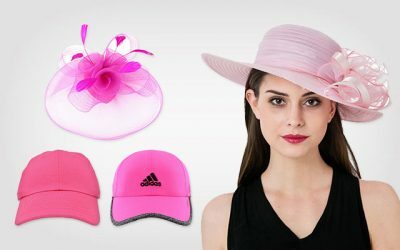 I hope that with the list of the best straw hats for women in 2018 that I summed up above, you can easily pick up the best straw hat that meets all of your needs and requirements in styles and quality.